Cadbury has announced it is going to launch a new campaign on May 10th, encouraging consumers to ‘Share the Taste’. Aiming to create a movement of genuine human connections across Australia and to encourage more moments of sharing, Cadbury will generously give away an incredible amount Cadbury Dairy Milk, milk chocolate blocks Australia-wide. To help create real moments of connection amongst Australians and to launch it’s ‘Share the Taste’ campaign, Cadbury Dairy Milk will host a range of immersive consumer experiences around the country from May until July 2018. During this time, Cadbury will also be giving away an unprecedented amount of Cadbury Dairy Milk milk chocolate to encourage all Australians to take the time to enjoy a delicious block of smooth and creamy Cadbury Dairy Milk milk chocolate with loved ones and create meaningful moments of connection with one another. In May 2018, Australians far and wide will be able to connect with a loved one, or a new friend, through a virtual game of Choc, Paper, Scissors. In this activation, Cadbury will be popping up digital screens at sites around Australia that will live stream and connect consumers to another screen located in another State or Territory. Once the connection has been made, the vending machine will gift both participants a family block of Cadbury Dairy Milk milk chocolate, to ‘Share the Taste’ with their family and friends. After the Choc, Paper, Scissors activation Cadbury will embark on its national ‘Share the Taste’ Tour; stopping in key regional towns to ensure that its Cadbury Dairy Milk milk chocolate block giveaway reaches far and wide to different parts of Australia. Consumers will enjoy activities such as games, music and, of course, Cadbury Dairy Milk milk chocolate throughout June. 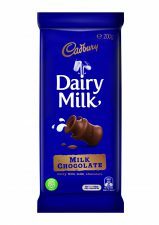 Cadbury will launch a number of sensational new Cadbury Dairy Milk branded products for Australians to enjoy, including the exciting “Packed with Yum!” range. The range will feature shareable family sized blocks with amazing textures and flavours inspired by your favourite Cadbury chocolate bars such as Picnic (180g block), Boost (180g block), Moro (180g block) and Crunchie (200g block). The Packed with Yum! range will hit shelves in May 2018 and will be available in all major Australian supermarkets, retailing at $4.99 per block.